One of the things I wanted to do differently this year was to make most of my birthday gifts, especially the ones for female friends. (Men always seem harder to craft for.) So, my first challenge happened early in the year. I have two friends and two coworkers all with birthdays in the first two months. 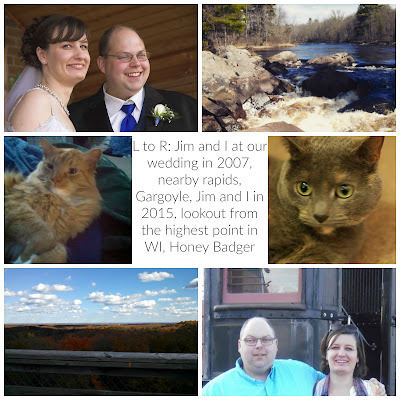 I've managed to create something crafty for all of them, but since I haven't seen some of them to give them their gifts I'm not going to show them all to you guys yet. :) And as a side note, is it just me or is like everyone you know born in February? Anyhow.... on to craftiness. 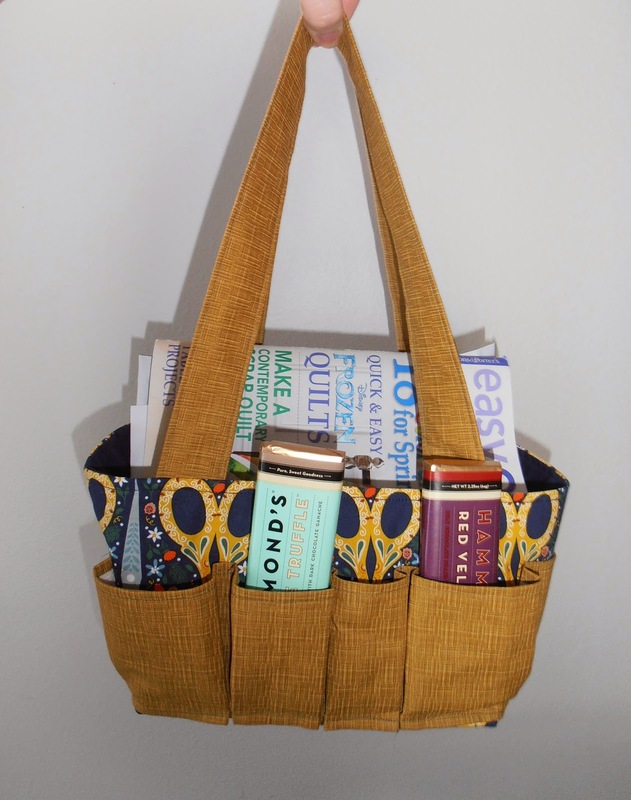 So, today I'm going to show you the Travel Craft Bag I made with a PDF from Craftsy. The pattern is from Stitch by Stitch and free so if you think you want to try it out, go for it! I think Travel Craft Bag is kind of a misleading description for this little treat. I'd call it more like a basket with handles. Crafty Basket filled with Goodies! No zippers, snaps, or closures to mess with. The whole thing can be cut with a rotary cutter and mat. No pieces to pin and cut out. Small pattern pieces makes it a good chance to use up extra pieces of interfacing. Finished project is cute and functional. It's about six inches deep and can hold a magazine or some hand stitching fabrics or embroidery projects. The pockets are great for holding your supplies (or chocolate). I found the instructions on the pockets confusing and it took me a while to figure out what I was doing, and even so, I managed to goof up the sizes of the pockets. The instructions for the straps have you cut two pieces of interfacing for each strap and make it much more complicated than it needs to be. 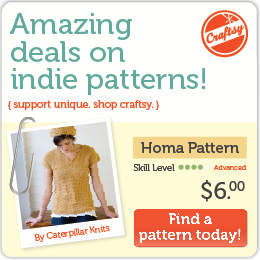 If you want to find other great indie patterns on Craftsy, just click the pic below. There's stuff for sewers, knitters, and crocheters.